The panels are manufactured to form a mesh pattern of 76.2mm x 12.7mm using 4mm diameter vertical and horizontal wires which are resistance welded at each intersection. This method of construction produces a panel that is both formidable in strength and appearance. A range of square hollow section posts are available to suit the specified fencing which is offered in the heights from 1.20m to 5.20m. The panels are attached to the post by means of a 75mm panel overlap and clamp bar arrangement which is securely fixed to the post by M8 bolts and Permacone nuts. Factory fitted inserts together with stainless steel Permabolts are available as an option. 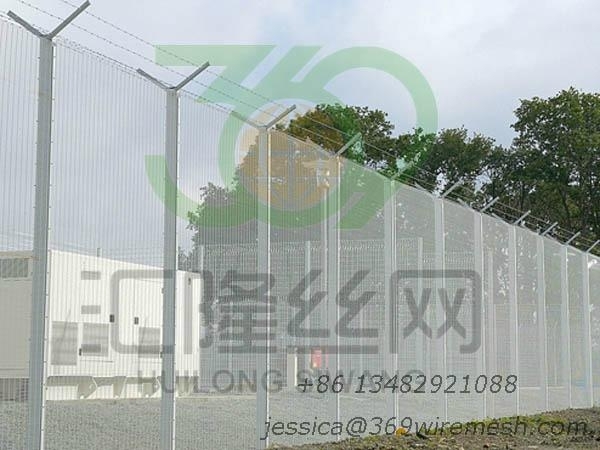 Securifor 358 security panels are extremely difficult to penetrate, with the small mesh aperture being effectively finger proof, and extremely difficult to attack using conventional hand tools. It is also very difficult and time consuming to attempt to pass items from the protected area through the fencing, and for this reason alone makes the protection of valuable wire and cable a viable proposition. The bottom of the panel can be supplied extended 300mm in base for burying below the ground. A concrete sill can also be specified to counter efforts to burrow beneath the fence line. Brackets to support barbed wire or tape provide additional protection to deter the most ambitious climber. The welded panels have a Zincalu Super coated which has a combined zinc and aluminium content offering an enhanced lifespan. The posts and clamps are hot dip galvanised. Panels are usually supplied with a polyester powder coated finish in RAL 6005 (green) or RAL 9005 (black) and other colours are available upon request. Polyester powder coating provides additional protection to the primary Zincalu Super layer and increases the potential life span.